Images and fact sheet follow text. 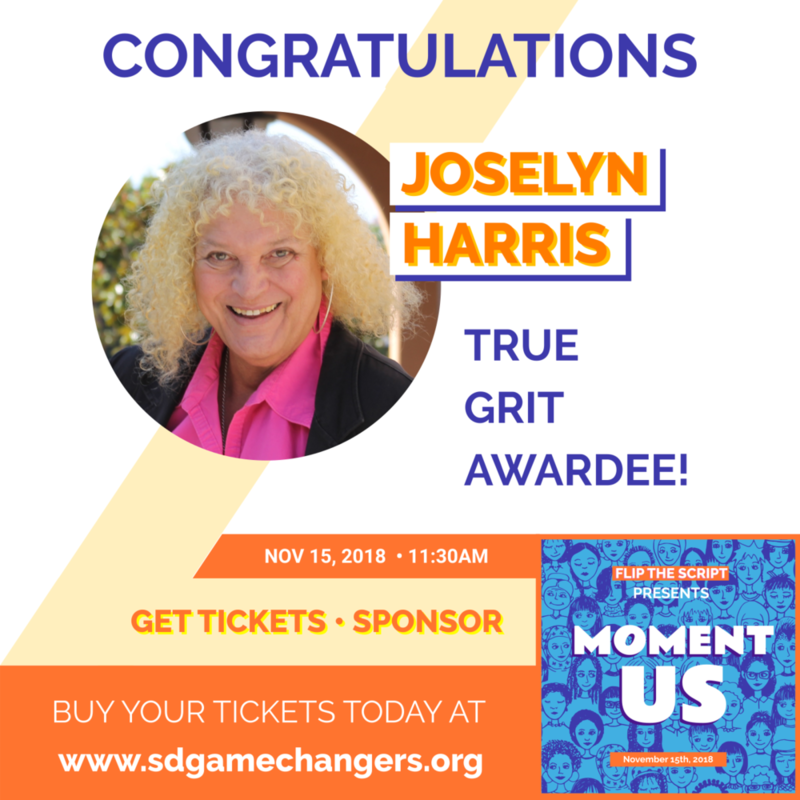 SAN DIEGO - San Diego-based political podcast Flip the Script: The Future is Female is proud to announce Joselyn Harris, LGBT trailblazer and advocate, will receive the “True Grit” award at the much-anticipated 2nd Annual Women Who Change the Game Awards Celebration in San Diego in November. Joselyn Harris has opened many doors for the LGBT community as the first openly transgender staff member at UC San Diego Medical Center. As a Registered Nurse holding both a Master of Science degree and Ph.D., Dr. Harris has been instrumental in eliminating bias and discrimination within a healthcare setting, paving a way for improved communication between hospital staff and LGBT patients. She also has provided education and consultation on LGBT issues to countless Skilled Nursing and Rehabilitation Facilities. Further, Dr. Harris has been on the forefront of advocating for the LGBT community through sitting on a multitude of boards, including the Chancellor’s Advisory Committee on Gender Identity and Sexual Orientation Issues at UC San Diego, the Equality Professional Network, the San Diego County HIV Prevention Board, and the San Diego Human Dignity Foundation. All of her work led her to receiving the 2017 Equal Opportunity/Affirmative Action and Diversity Award at UC San Diego. As a veteran, she knows how to fight - and she’s used that to the advantage of the entire LGBT community in San Diego as she continues to fight for us. Colin King, Board Member, Human Dignity Foundation, said "Joselyn is held in high esteem by her UCSD colleagues, the LGBTQIA+ community, and fellow members of any board/community project she's been on, she has made enormous waves throughout San Diego. I currently sit on the Board of Directors of the San Diego Human Dignity Foundation, for which she is the current Board President, and she constantly advocates for innovative ways to make an impact, whether that be through the grants we provide, the young leaders she mentors, or sharing her stories in hopes of a brighter future." The awards ceremony will take place on November 15th, 2018 at the Jacobs Center for Neighborhood Innovation in Southeast San Diego and benefits the podcast hosted by Ismahan Abdullahi, Director of Movement and Campaign Strategies at Partnership for the Advancement of New Americans (PANA), and Nicole Capretz, Executive Director of Climate Action Campaign, both nonprofits based in San Diego County. Including Dr. Harris, the event will honor three women who have shown outstanding progressive leadership in San Diego: those who have taken action, spoken up and successfully fought for key progressive issues. The featured guest at the event will be the groundbreaking Olympic medalist, author and entrepreneur Ibtihaj Muhammad. The celebration on Thursday, November 15th, 2018 will last from 11:30am - 1:00pm. Tickets are available now for purchase, and sponsorships including tickets!